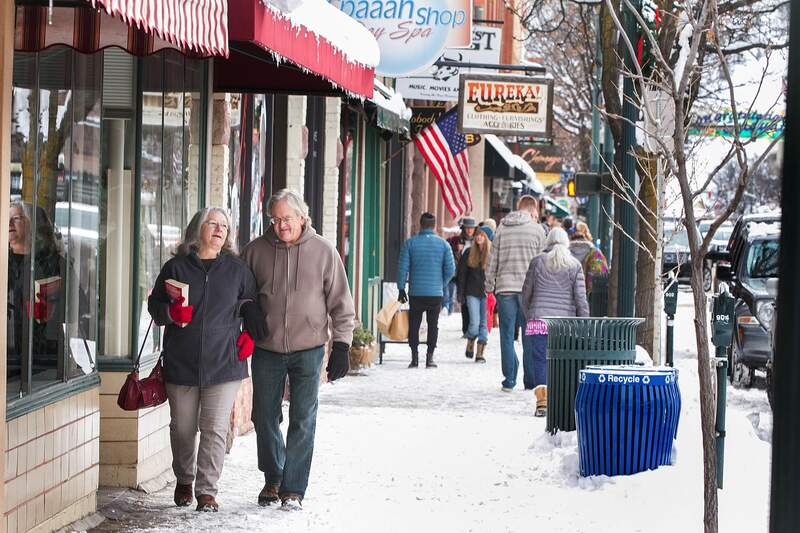 The Durango City Council asked the Business Improvement District Tuesday to look at how to keep sidewalks clear of snow in the winter and gum in the summer. The Durango City Council focused on cleaning sidewalks, marketing and panhandling outreach while reviewing the Business Improvement District’s budget Tuesday. The BID is funded mainly by a property tax that is expected to bring in $258,300 next year, but is also budgeted to receive $65,000 from the city. The council sets aside money each year for the BID to run Fourth of July celebrations, among other programs. The council asked BID Executive Director Tim Walsworth to explore cleaning sidewalks in summer and clearing snow from them in the winter. Currently, it is the business owners’ responsibility to clear snow from sidewalks. However, if they don’t do it early in the morning, it can get packed down and become a hazard, councilors said. With some empty storefronts along Main Avenue, the councilors want to make sure someone is maintaining those sections of sidewalk, as well. “Downtown is our gem and our showcase,” Mayor Christina Rinderle said. The council also questioned how much marketing BID should be doing outside Durango because the Durango Area Tourism Office is focused on bringing people to town. BID manages a $25,000 grant program for the city to help promote special events outside the area. Rinderle would like the council to meet with both BID and the Durango Area Tourism Office to discuss marketing and to ensure the organizations are not duplicating efforts. Councilor Sweetie Marbury complimented BID on its homeless outreach coordinator, who talked with panhandlers this summer to connect them with services. BID also ran a campaign to encourage people to give to charities and not to panhandlers, and it raised $784 for the Durango Community Shelter this summer, Walsworth said. Rinderle would like to reach more tourists with a similar message about the services the community provides to homeless people and to encourage them not to give to panhandlers. “We got a lot of emails with people saying that they are never going to come here again,” she said of tourists’ reaction to panhandling. Only a handful of lodgers agreed to put up posters about giving to charity instead of to panhandlers this year, Walsworth said. “I think it’s a hard message for them to deliver,” he said. BID plans to continue its downtown ambassador program focused on greeting and guiding visitors that it developed to help the area counter a negative image created by an increase in panhandling. BID also plans to cut weekly care for downtown flower barrels from its budget as a cost-saving measure. Shop owners have been responsible for the barrels, and that will continue, Walsworth said.